Stanley W. Rosskamp passed away on Friday, October 19, 2018 in Denver, NC at the age of 82. He was born May 7, 1936 to parents Eugene and Stella Rosskamp in New Kensington, PA. 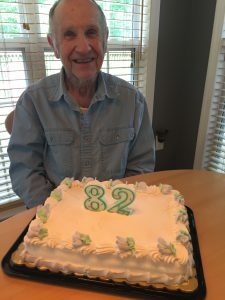 He was married for 62 years to his wife Connie Rosskamp and they resided in Springdale, PA until 1996 when they moved to Denver, NC.He leaves his wife Connie, son Mark Rosskamp and Grandson Matthew Rosskamp. Stanley served in the U.S. Army for 3 years and was stationed in Germany from 1955 to 1957. He then worked for Westinghouse in Cheswick for 38 years until he retired. He was an avid model railroader and a member of the Western Pennsylvania Model Railroad Museum in Gibsonia, PA, where he has built 69 buildings and structures for the layout. A private memorial will be held at a future date with family in Pittsburgh. Stanley suffered from dimension and the family suggests voluntary donations be sent to Alzheimer’s Foundation of America as an alternative of flowers. So sorry to hear from cousin Bobbie Albright McDonald And Kathy. We lost Dad on April 10th this year . Mom send s her sympathy Connie .